In crisis or wartime the NDF would have the principal responsibility for defending Namibia's navy domain and coastline against attack. To ensure that the NDF would be able to undertake this task when required, a professional military navy force was created. This force trains and operates routinely as part of an offshore protection force to develop the capacity. It is a fundamental principle that, in designing and establishing a maritime patrol capability, consideration is given to its utility in crisis and war, since the means acquired for peacetime operations will inevitably have a war role. The MOD recognises that the defence role should be but one of the tasks of a national offshore protection force. In peacetime, the Navy of the NDF have a role of augmenting civil offshore patrol forces, particularly providing the means and the expertise to execute enforcement action effectively. Specific tasks include assisting civil forces to combat illegal immigration, smuggling (arms, drugs etc.) and threats to the environment; conducting maritime surveillance, search and rescue; and assisting the Ministry of Fisheries with enforcing a fisheries protection regime. A longer term peacetime task is the protection of offshore oil, gas, diamonds and other installations. A navy aerial surveillance component is a necessary part of the defence system. Arrangements for the transfer of vessels owned by other ministries and commercially owned vessels to the NDF during crisis or war will also need to be made. Joint training, co-ordination and planning with any other ministries involved is essential. The Namibian Navy emerged in 1994 and the first training of pioneers group composed of Ship Officer, Ship Captains, Command and Staff Officers started in 1995 in Brazil. In 1998 the Maritime wing was established in Windhoek and subsequently the Naval Base in Walvis Bay in 2000. In 2002 the first Patrol Vessel ORYX was obtain by means of donation and in 2004 another Patrol Vessel Dimo Hamaambo was acquired from Brazil, the same year the navy was commissioned into a full fledge. 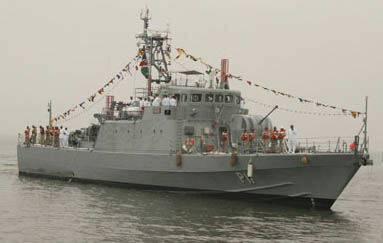 The 5th Navy day celebrated at naval base, Walvis Bay on 10 October 2009 surfaced enormous success achieved by Namibia’s seamen. Capt Navy Nghipandua said, men and women in white or blue have been actively carrying out maritime patrol and onshore support duties to civil and other law enforcement agencies as envisaged by the Constitution. He also mentioned that the navy like other Namibian Defence Force (NDF) Arms of Services pledged support to Southern Africa Development Community Standby Force (SADCSF) and participated in Excersice-Golphino. He said starting from a scratch is not easy as it may look. “Building and administering a new Force is not easy as running and old and experience one, adding that “it requires both local and external expertise.” He referred this to the good cooperation and mutual standing between the Namibian and Brazilian Government, as he went on to say, the Brazilian experts has been consistently offering advice on part of naval operation and the presence of Capt Navy Jose Calixto Dos Santos Junior, Commander of the Brazilian Technical team at the event justify the Brazilian generosity and long term standing friendship. His Excellency, Dr. Hifikepunye Pohamba, President of the Republic of Namibia and Commander-in-chief Of The Namibian Defence Force on the ocassion of the commissioning of the Naval Base, Naval Jetty And The Logistics Support Vessel, the NS Elephant - 07 September 2012, Walvis Bay, Erongo Region: "The acquisition of these strategic assets is part of our ongoing commitment to strengthening our national institutions. As a maritime country, Namibia needs capacity, not only to protect our Exclusive Economic Zone, but also to respond to unforeseen events that may occur in our territorial waters. "The construction of the new Naval Base started in October 2002 and with the handing over of the jetty by the contractor in April 2012, the Naval Base, for all practical purposes, is now operational. The arrival of the new vessel, NS Elephant on our shores is a significant milestone in the development of the Namibian Navy in particular and the Namibian Defence Force in general. It represents a welcome boost to our capacity to ensure that our Navy has the right equipment to effectively and efficiently carry out the duties and responsibilities entrusted to it. This vessel is one such acquisition. "It joins another naval vessel, NS Brendan Simbwaye and the two Harbor Patrol Boats Möwe Bay and Terrace Bay which were recently acquired. Together, these ships and the men and women who sail in them constitute the frontline in the protection of our nation’s maritime interests, which form part of our sovereignty and territorial integrity. In addition, the vessel can be used for the transportation of cargo and troops, for offshore patrols, for high seas Search and Rescue Missions, for research as well as for the training of sailors. I have no doubt that the NS Elephant will live up to her name in terms of its strength and character, as a formidable asset in Namibia’s naval fleet." As a means to safeguard Namibia’s coastline, the Namibian Navy needs enough resources to meet the demand of the maritime operations. Hon. Nahas Angula, Minister of Defence said during the 10th Anniversary celebration of the Namibian Navy (NN) held in Walvis Bay on 10th October 2014. The Minister was however optimistic that the Namibian Government will continue to provide the Namibian Navy (NN) with enough resources for training Navy personnel, acquire assets, infrastructure and facilities in order to boost its maritime defence capabilities. The establishment of the NN was delayed by the reintegration Walvis Bay, the only modern port in the country back to Namibia from South Africa, but this did not deter the preparation of its inception. “The need to establish the Namibian Navy as a Wing of the Namibian Defence Force (NDF) started in 1990 at the onset of Namibian’s independence, with the mission to protect and defend the country’s coastline. The Minister of Defence however, cautioned the navy personnel to be on alert for any illegal activities in the Namibian Water. “Your have to remain vigilant at all times so that the Namibian coastline and its resources are safely protected,” the Minister cautioned the maritime members. Meanwhile, Rear Admiral Peter H Vilho, Navy Commander said “Throughout the 10 years the NN achieved individual tasks, such as transforming a wasteland into the Naval Base, accommodation, dining, medical and recreational facilities, establishment of Officers, Warrant Officers and Non-Commission Officers Corp. The Navy also acquired means that can impart on sailors the skills to engage in combat, provide combat support and combat service support. Rear Admiral further indicated that the Navy has laid the basis to build a combat capability, patrol, transport, offshore surveillance and riverine operations capabilities”. The commissioning of the NDF’s Maritime Wing into a Navy has, just like the Air Force, upgraded its status and expanded its role of defending Namibia’s maritime interests. In crises or wartime the NDF would have the principal responsibility for defending Namibia’s maritime domain and coastline against attack. To ensure that the NDF would be able to undertake this task when required, the development and professionalization of the Navy shall be pursued until its desired capability is achieved. Necessary resources should be made available to expand the Navy’s capability from that of coastal patrol, to that of maritime deterrence with force projection capability. The Navy’s wartime role would include surveillance and security of the country’s entire coastline; naval combat engagements; search and rescue operations, casualty evacuation; naval blockades and landward combat operations by maritime airborne and seaborne forces. In peacetime the Navy would have the role of augmenting civil offshore patrol forces, particularly providing the means and the expertise to execute enforcement action effectively. Specific tasks would include assisting civil authorities to combat illegal immigration, smuggling (arms and drugs) and threats to the environment, as well as assisting the Ministry of Fisheries and Marine Resources with the enforcement of the fisheries protection regime. create and maintain fully operational naval bases and auxiliaries, e.g. naval call station at Cape Frio as well as an integrated logistic support system. plan to create a marine corps.